Science is all around us! 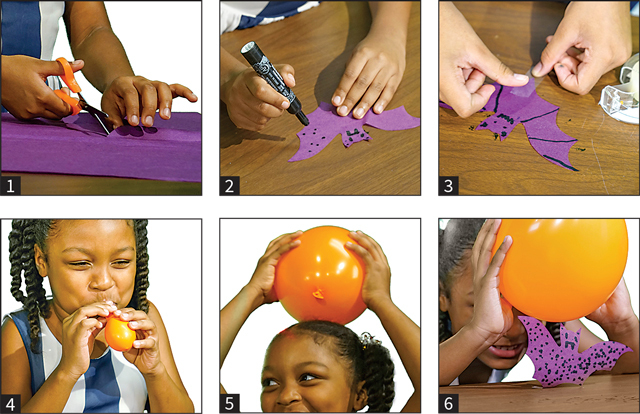 Kids can explore a common concept with a fun Halloween angle using this experiment. 1. Cut your tissue paper into the shape of a bat. 3. Tape the bottom of your cut-out bat to your work surface. 4. Blow up and tie your balloon. 5. Rub the balloon on your hair or a sweater. 6. Pass the balloon over your bat without touching it and watch your bat dance. Did it look like your bat was dancing? Why was the tissue paper attracted to the balloon? Although you can’t see it, everything is made up of small particles called atoms. Two parts inside the atom – protons and electrons – contain charges. Protons are positive, and electrons are negative. They are attracted to each other the way the north and south pole ends of magnets are attracted to each other. Atoms also contain a third part which is neutral, called neutrons. 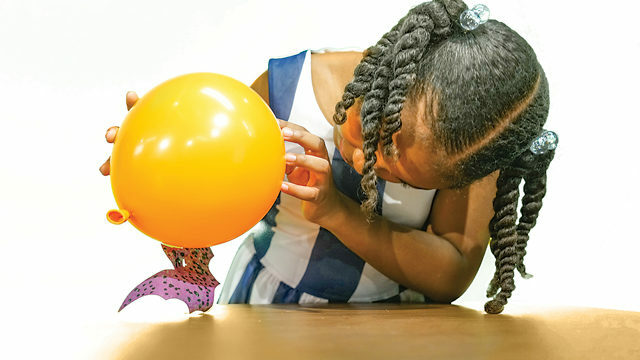 When you rub the balloon on your hair, you are adding a bunch of electrons (negative charges) to the surface of the balloon. The tissue paper has a more positive charge. When the tissue paper and the balloon come near each other, they are attracted to one another and your bat dances! This is the result of static electricity. Try other materials to see if they react to static electricity. Charge up the balloon by rubbing it in your hair and hold it near other people’s hair, or a small trickle of water. Does it change how the hair or water reacts? Just be cautious not to shock the next person you touch! You can also try confetti or even crispy rice cereal. 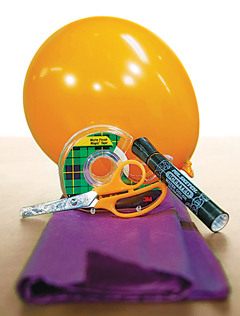 If you build up enough charge, the balloon may even stick to a wall and look as if it is taped or glued to the wall. Eventually those extra electrons (negative charges) will fade, and the balloon will fall off the wall.